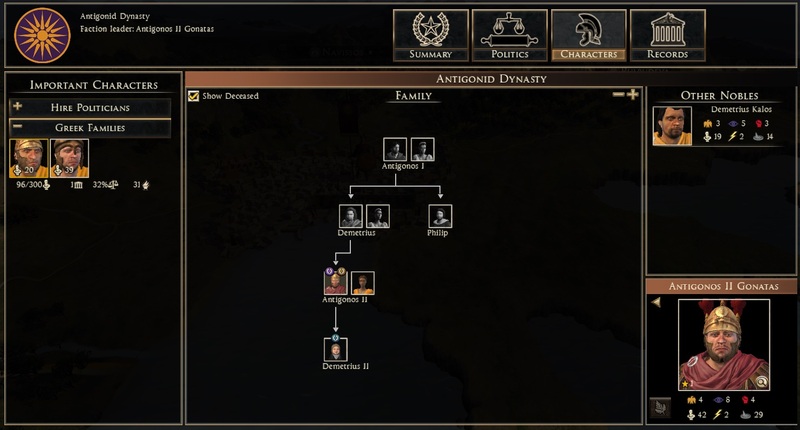 The long-awaited Family Tree for ROME II is here! 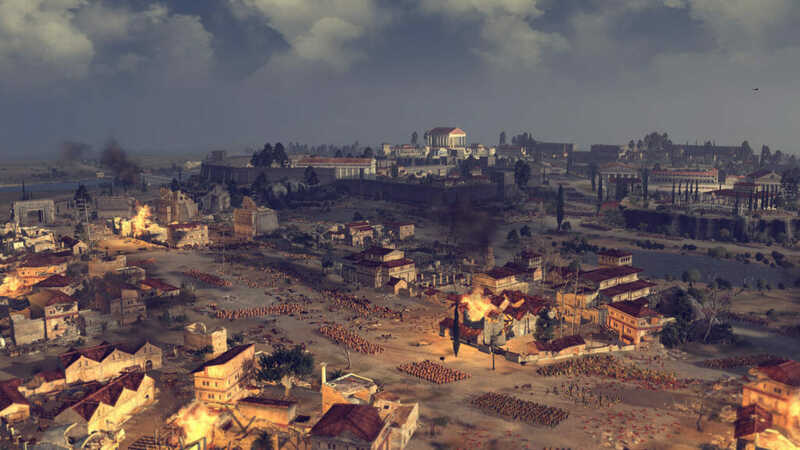 The free Ancestral Update introduces this community favourite feature along with numerous tweaks, fixes, and improvements to ROME II’s base game and DLCs. The update is currently in open beta to ensure it works for all users before release, and will therefore require you to opt in with details of how to do this below. We welcome any and all feedback – again, find out where you can do this below. As you may have guessed from the latest what the teams are working on blog post, a ROME II DLC announce will also be coming very soon. Will opting in break my save games? Where should I report any Issues? There are also additional patch notes for the Ancestral Update here. 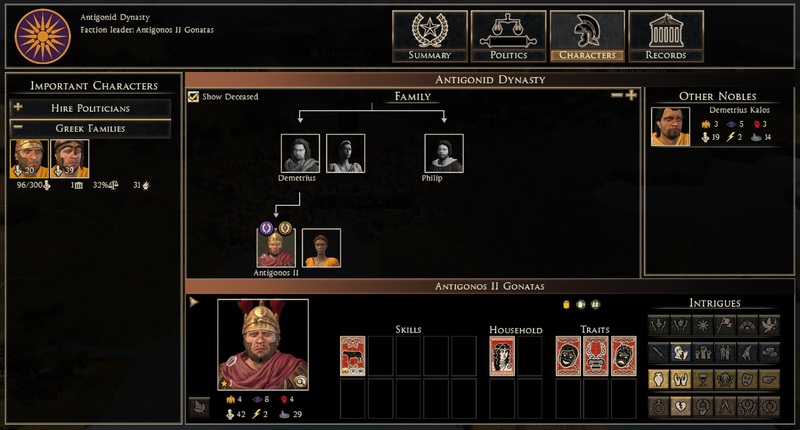 The Family Tree is a visual representation of the web of character relationships within your faction, and offers the functionality for you to interact with those characters and generate Intrigues, which bring new gameplay options. The characters in your faction can forge strong bonds and alliances with other factions. Marriages can produce offspring, who grow and obtain duties of their own. Characters are born, live their lives, and eventually die throughout the course of a game. Here’s an example of the Macedonian family tree from the Grand Campaign. The central panel contains members of the player’s family. The panel on the right, labelled Other Nobles, contains characters who are members of the player’s party, but not included in the family. The panel on the left, labelled Important Characters, contains characters of other parties – Ones that may turn hostile in the case of secession or civil war, for example. Every living, adult character has access to a certain number of Intrigues: actions that can be executed to achieve a variety of outcomes. In the screenshot below you’ll see them in the bottom right corner. How do I opt in to the Ancestral Update? No. We’ve deliberately worked to ensure old save game compatibility with the update. The game generates a new Family Tree based on the data in your save game, and refunds any skill points you’ve already spent on your Agents, enabling you to spend them in the new skills tree to your preference. Issues are still possible, of course – Please report any that you find! Should I disable my mods? Absolutely, yes. Mods are frequently incompatible with new releases and will remain out-of-date until the mod creator updates their mod. We would like to ensure all the feedback we receive for this beta comes from campaigns played with all mods disabled, so we can be sure that any new fixes we may have to explore are focused on the core, unmodded game, and not a result of out-of-date mods. 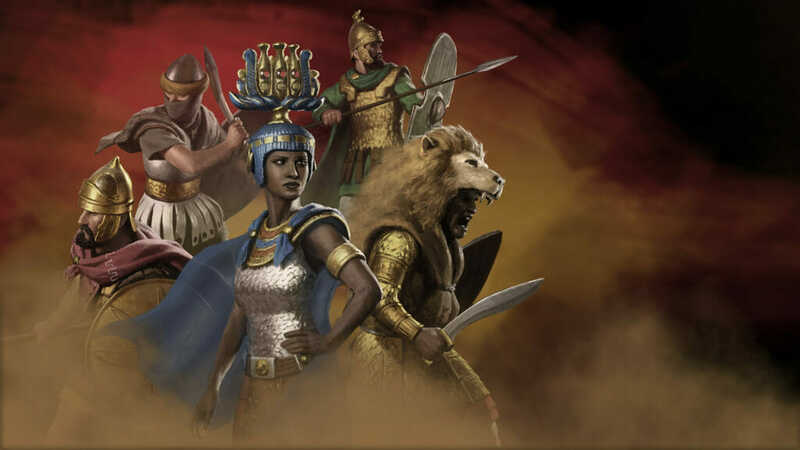 Any issues should be reported in the dedicated Ancestral Update issues thread on the official Total War forums, which we will be monitoring closely. Added “Terrain noise” to make distant terrain look less flat. Improved shadow quality & performance. Missile Range bonuses now actually work! Events sometimes occur more often than expected.